The Trojan Ambassador Association is looking to hire new ambassadors for the fall 2013 semester and with several senior ambassadors graduating in May, there will be numerous openings. 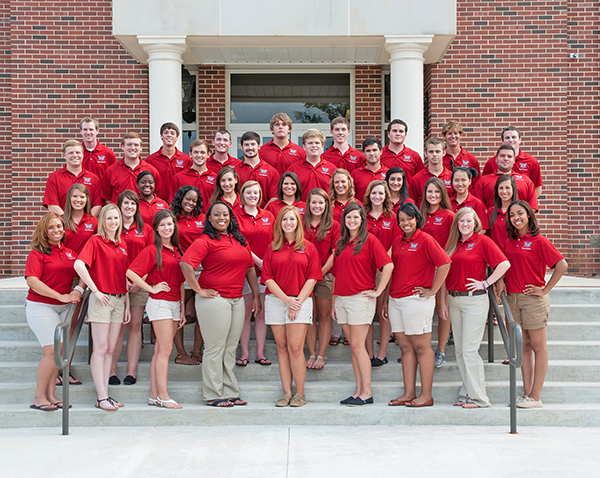 The Trojan Ambassadors are the official Troy University host or hostess for the Chancellor’s receptions and activities, athletic events and organizational events as needed. While they perform their host and hostess duties, the ambassador’s most important role is to be a student recruiter. Hunter Beck, a senior broadcast journalism major from Brantley,. started in fall 2011 and is on the executive board this year along with five other ambassadors and has been helping advisors with the application and interest meeting process. Tours are one of the main events in the student recruiting process. Ambassadors show the potential students the campus life including the dorm styles, campus life, the classroom setting and what organizations to be involved in. Interest meetings were held both Monday and Tuesday in the Trojan Center for prospective ambassadors to have the chance to hear more information about being a Trojan Ambassador including the requirements. Not only must the potential Trojan Ambassador have a 2.5 GPA, but must also be a full-time student, well versed at Troy University, he or she must write an essay on what Troy means to him or her, the prospective ambassador cannot be a member of band, cheerleading, athletics, Trojan All Stars or Diamond Dolls due to conflicting schedules. If one were to receive the position of an ambassador, he or she must participate in mandatory events including Fall and Spring Trojan Day, Leadership Day, training dates and must be available for three weekday tours and three call campaigns. Applications were made available to the student body Wednesday, March 20 in the office of admissions and the deadline to return the applications is Wednesday, April 3. All interviews will take place on April 9 and 10 on the third floor of the Adams Administration building.